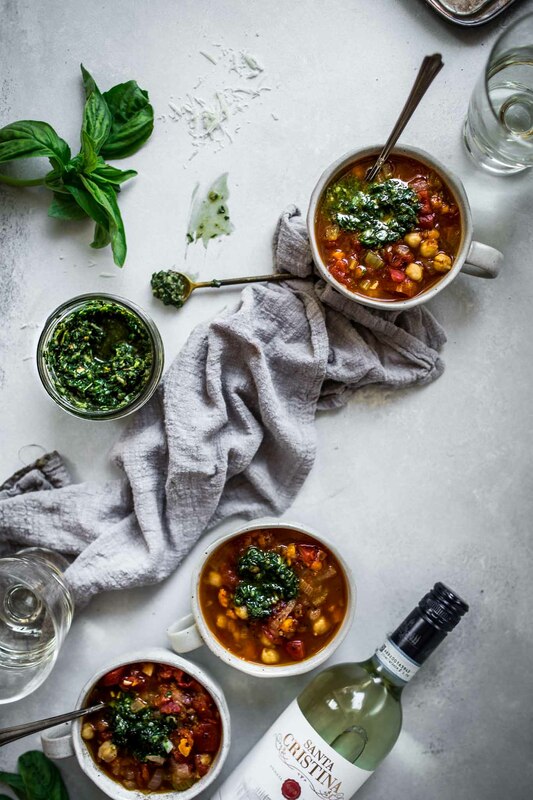 This Instant Pot Bean Soup with Pesto is made with chickpeas and tomatoes. It’s vegetarian friendly, super delicious and cooks up quick in your pressure cooker. 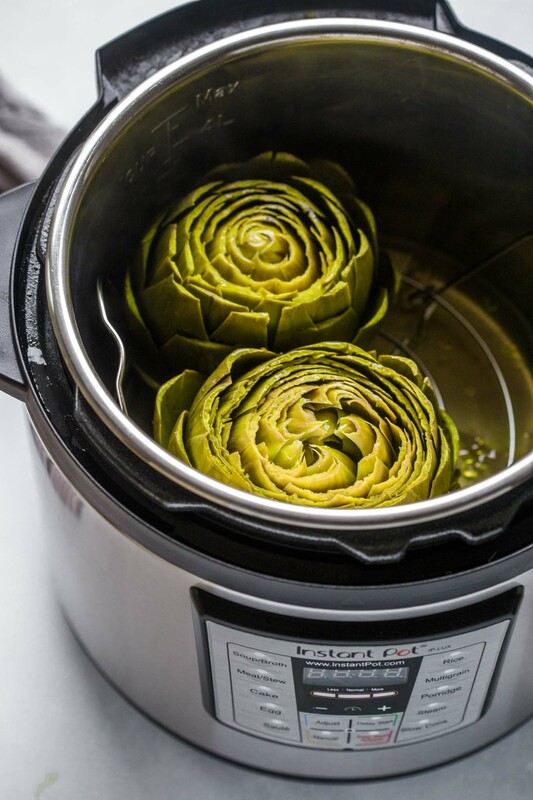 It’s been a while since I gave you all an Instant Pot recipe! I’m amping up on them again for sure, and to start things off, how about a recipe that’s perfect for Fall? 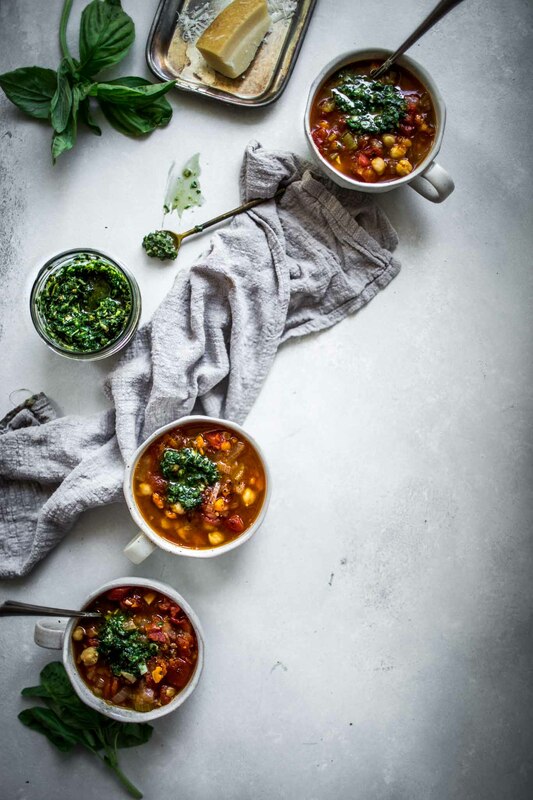 Instant Pot Bean Soup with Pesto. It’s just begging to be made. It’s super easy. 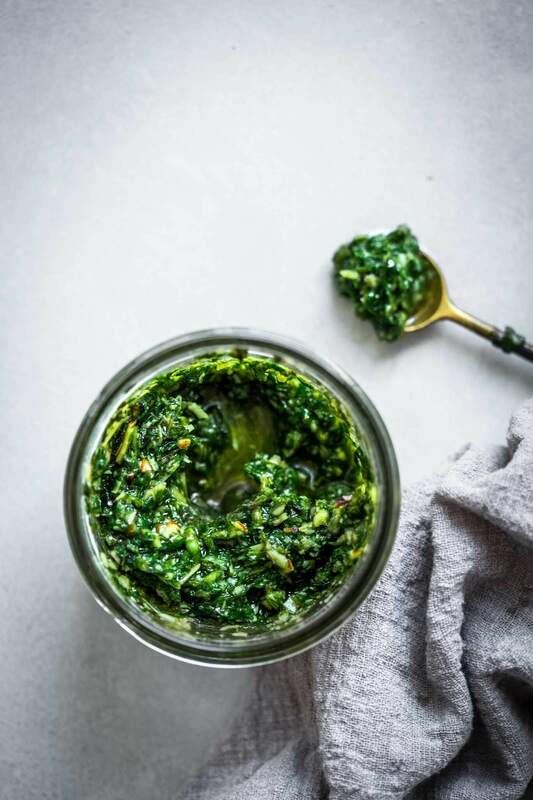 Just chop up some onion, carrots and celery, open a couple cans, and let the Instant Pot do its work while you prepare the pesto. It’s healthy and warming. 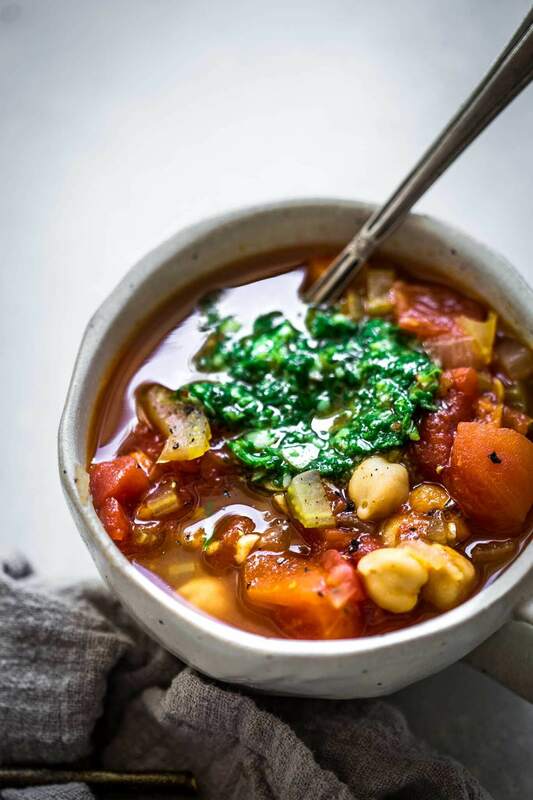 Loaded with fresh veggies and chickpeas for fiber and protein, this soup is perfect for the cooler months. It’s packed with flavor. The bean soup is amazing on its own, but the dollop of pesto on top takes it over the top. I would actually call this soup an Italian bean soup. 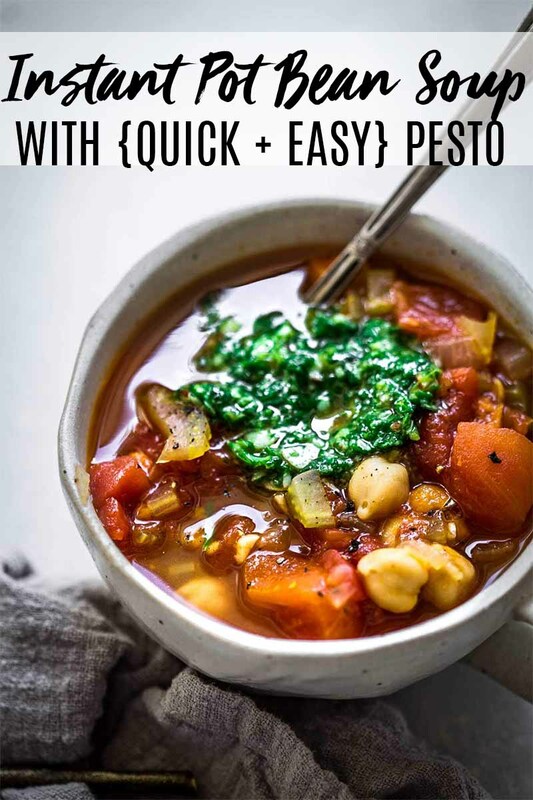 Not only does the pesto give it that touch, but the addition of lots of tomatoes into the mix almost makes it like a minestrone, without the noodles. 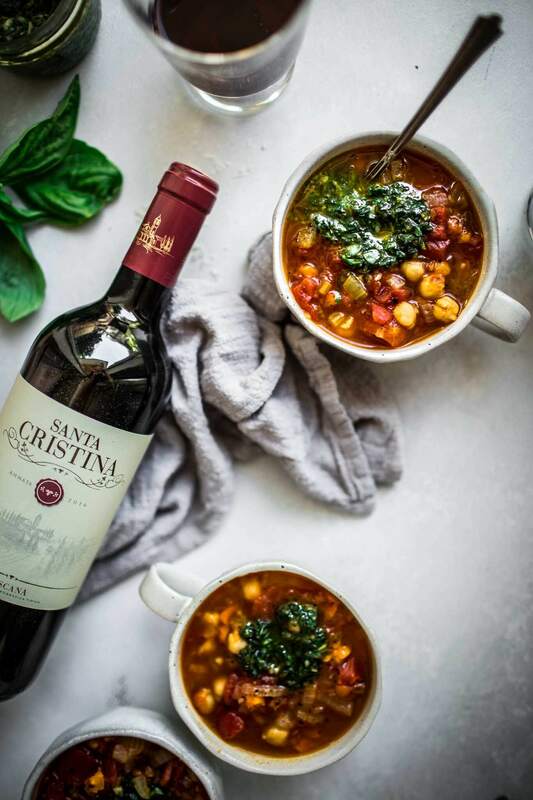 So, of course I had to pair this Italian bean soup with some Italian wines from Santa Cristina. The first wine that I paired with it was the Pinot Grigio. I loved how its bright acidity and citrus notes paired with the rich pesto that was swirled into the soup. But as you probably know by now, I’m a Rose girl. I wanted to give that pairing a try too. I really liked how the Cipresseto Rosato had a bit more body to it, but still that hint of acidity. It stood up nicely to the creamy chickpeas. And for Rick, we had to open up a bottle of Red. 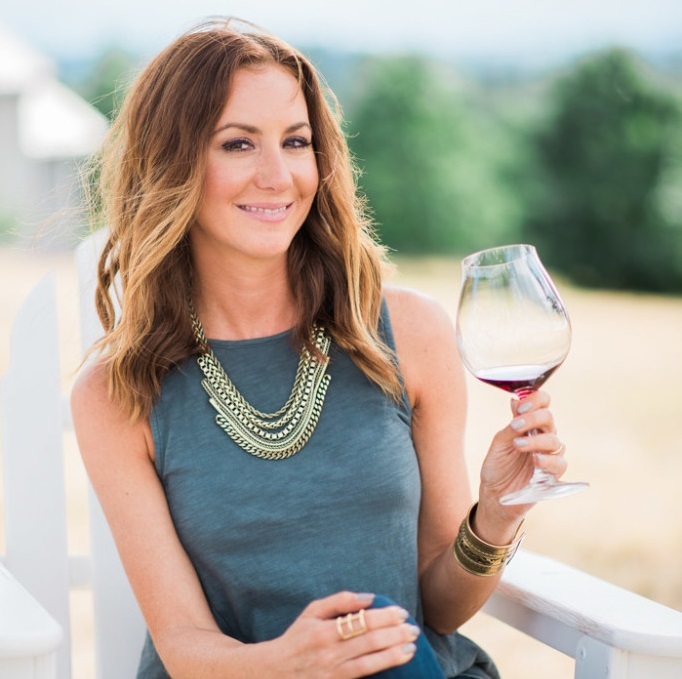 The Toscana from Santa Cristina features a blend of Merlot, Syrah, Sangiovese and Cabernet. It’s not overly tannic, which made it perfect for pairing with this tomato based soup. 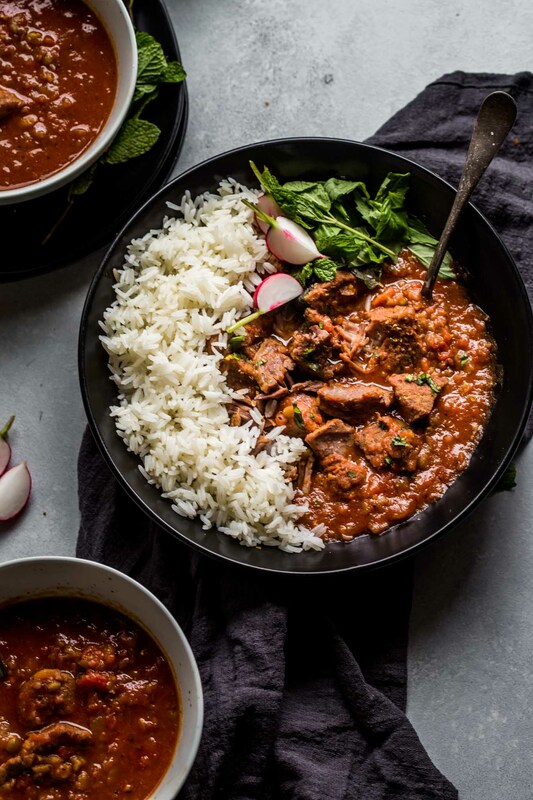 Which wine would you choose to pair with this Instant Pot Bean Soup? I’d love to hear your thoughts in the comments below. 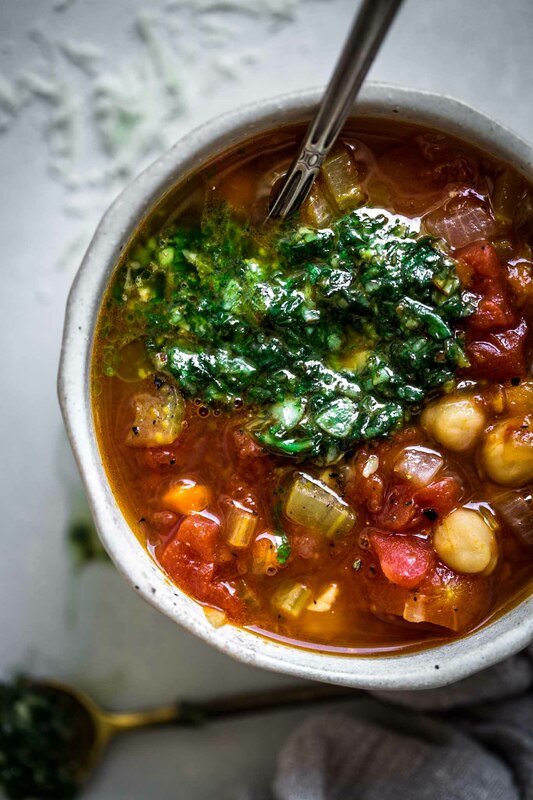 This Instant Pot Bean Soup with Pesto is made with chickpeas and tomatoes. 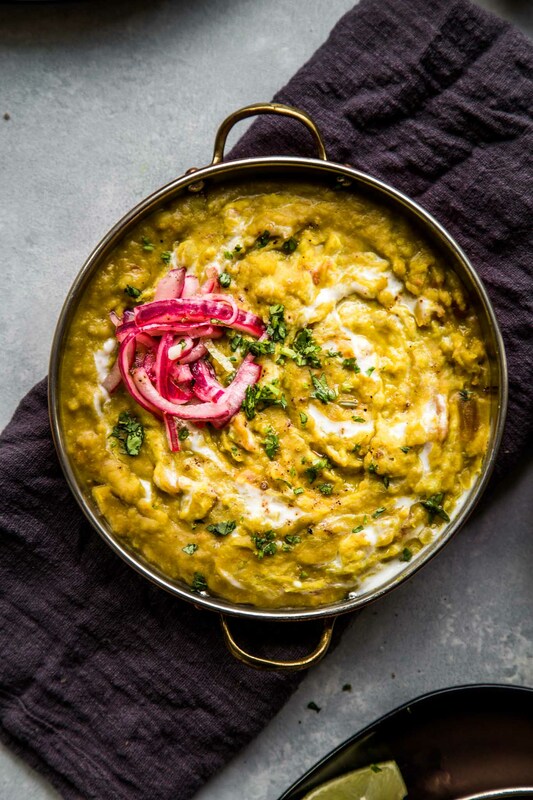 It's vegetarian friendly, super delicious and cooks up quick in your pressure cooker. Set Instant Pot to SAUTE and add olive oil. When oil is hot, add the onion and cook, stirring occasionally until the onion is tender, about 5 minutes. Add the garlic, carrots and celery. Keep stirring and cook about 5 more minutes. Add the tomatoes, chickpeas, stock, bay leaves, salt and pepper. Cover and seal the lid - turn the vent to sealing. Hit CANCEL then press the MANUAL (high pressure) button and set the timer to 5 minutes. It will take about 15 minutes for Instant Pot to come to full pressure, then the display will show a countdown timer. When timer beeps, let pressure release naturally for 5 minutes, then do a quick pressure release. While the soup is cooking, prepare the pesto. Place the garlic and pine nuts in the bowl of a food processor fitted with a steel blade. Process for 15 seconds. Add the basil leaves. With the processor running, slowly pour the olive oil into the bowl through the feed tube and process until the pesto is thoroughly pureed. Add the Parmesan and puree for a minute. When the soup is finished, remove the bay leaves. Taste and season with pepper and more salt if needed. Serve in individual bowls topped with pesto. The pesto can be made in advance. Store it in the refrigerator or freezer with a thin film of olive oil on top. It will keep in the refrigerator for 3 days or the freezer for a month. 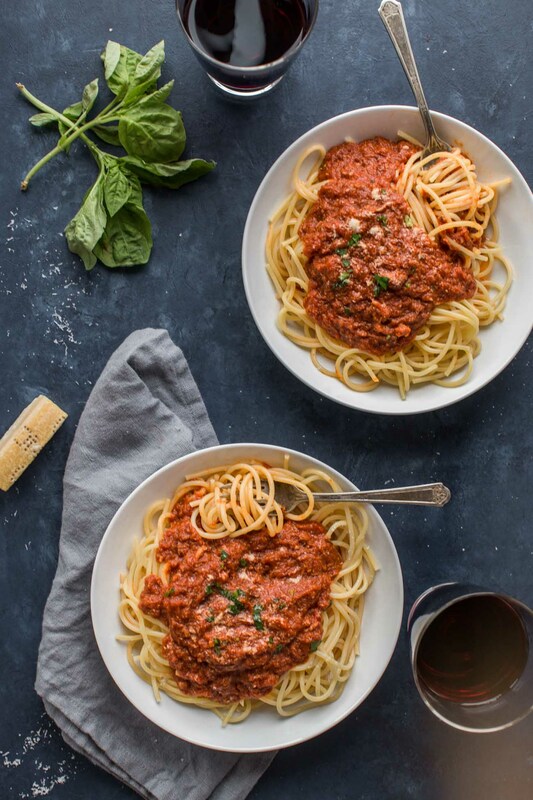 This recipe was originally published in October 2018. It was updated in March 2019 to add a video. The original recipe remains the same. Enjoy! I teamed up with Santa Cristina to bring you this post. As always, all opinions are my own. If you loved this Instant Pot Bean Soup recipe I would appreciate it so much if you would give this recipe a star review! Also, be sure to snap a picture of your finished dish and share it with me on Instagram using the hashtag #platingsandpairings and tagging me @platingsandpairings. This looks seriously yum. Now that the fall weather has turned cold and rainy, I eat soup around 5 times a week! I’ll be trying this recipe soon. I’m with you Catherine – I’m on a definite soup kick right now! Soup all the time!! This looks good enough that I’m considering an InstaPot right now… the pesto is a really nice touch! I absolutely love my Instant Pot Hawnuh! I’ll bet you could put it to good use too! Yum, this sounds so wonderful and cozy. It really is a comforting soup!